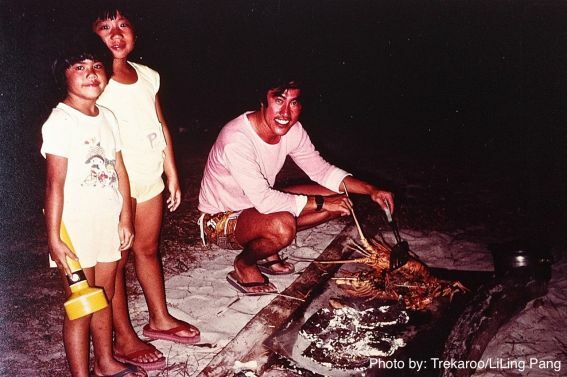 Lobsters, a deep well, and a very large centipede: such were the fishing-camping trips of my childhood to deserted islands in Malaysia. My sisters and I have the fondest memories of these trips. Now, we are grown up, live in the US, and have kids of our own. 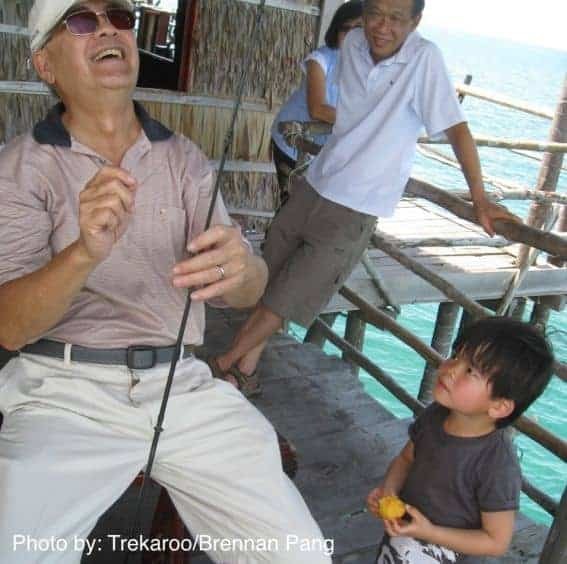 Still, we long for Grandpa to take his Grandkids on an “old school fishing trip” in Southeast Asia, just like the ones we enjoyed as children. I grew up in Singapore in the 70’s and 80’s when our little island city was booming. Farms had mostly been replaced by high rise apartments, office buildings, and factories. It wasn’t quite as shiny as the Singapore of today, but even back then, the small island country was already 90% urban. As with most newly developed countries, most Singaporeans who traveled were drawn to the big cities of the world. My Dad was the exception. He shared stories of hunting wild boar in the jungles of Malaysia with his father. It’s no surprise that though my parents had girls, they were determined to take us camping. Our trips were often to the deserted islands of Malaysia. The island that captured my heart as a 5 year old was Pulau Dayang (translated as Shark Island). Pulau Dayang is a small island off the east coast of the Malayan Peninsula. In those days, it was accessible only by a wooden fishing boat covered in a layer of grease and salt, smelling pungently of diesel. 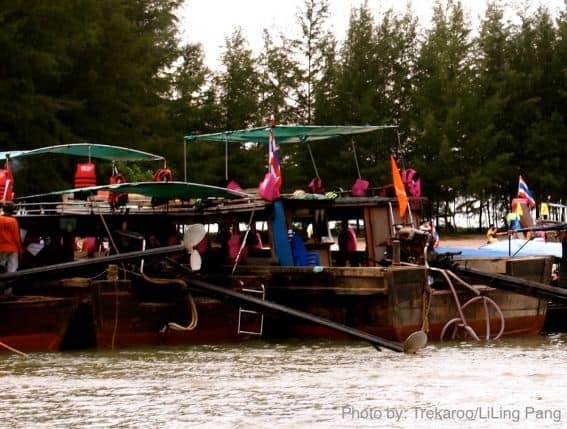 The fishing boat was chartered from the fishing town of Mersing. Our group of 3 to 4 families would drive from Singapore via a single lane pothole ridden road. After the five hour drive, the dads would negotiate a fee with the long boatman using broken Bahasa Malayu, and then we would unload all our gear on to the rickety wooden dock. Although we tried to pack lightly, the amount of gear we brought with us was mindboggling. From drinking water, to a 40 lb propane tank, large canvas army tents, fishing rods, ice-chests packed with food, and more, we were quite the spectacle. The island we were heading to was idyllic, untouched, untamed, and uncivilized. In fact, there was just one family who lived there and they had one fresh water well. That was it. The eight hour boat ride always seemed to take forever, so we’d leave at dusk and sleep through the bulk of the journey. We fell asleep on a hard wooden platform, high on diesel fumes, with the engine roaring so loud it seemed to drown out our dreams. Even today it seems like magic that the boatman would find his way through the darkness without GPS or a compass. The boatmen navigated through the night using the stars and their intuition. As morning dawned, we’d find ourselves pulling up to a green island surrounded by turquoise waters fringed with the whitest of sand. The water was so clear you could see coral from the boat and schools of colorful fish fluttering by. I still remember the joy I felt as I ran to the edge of the boat eager to jump straight into the water. Camping on Pulau Dayang. Daily roll call of the kids. The parents handled the major operation of setting up camp. I was always one of the youngest children in the group, so I frolicked in the sand oblivious to everyone else. The others were busy setting up tents, putting together the camp kitchen that could feed 20 people, drawing water from the well for washing, and digging a huge trench to serve as our toilet for the week. As I look back now as a mom who has organized several car camping trips for my own family, this was certainly extreme family camping. Our days on Pulau Dayang were filled with simplicity – building sandcastles, snorkeling through pristine coral reefs, collecting seashells, going fishing with the dads on the long boat, eating coconuts, and barbecuing freshly speared lobsters in the evenings. Most nights the dads would go out night fishing and sometimes one or two of the kids would tag along. I remember my dad pumping up the large kerosene lamps, tying them to the edge of the long boat, and waiting for the pink squid to swim to the surface. We were all mesmerized by the warm glow of the hissing lamp. The calm was broken suddenly by the plunge of a big net into the water, scooping up the squid to use as bait or to make into curry the next day. Fishing is a sport for the patient. Despite my lack of this trait, my dad was always eager to stir my interest. Even with slimy fish flipping and flopping all around me, fishing line and hooks ready to tangle my small legs, and squid guts on just about every surface, I still loved going out fishing with the dads. I relished watching my dad jumping up and hollering in excitement when he felt the first tug of a big fish on the end of his line. 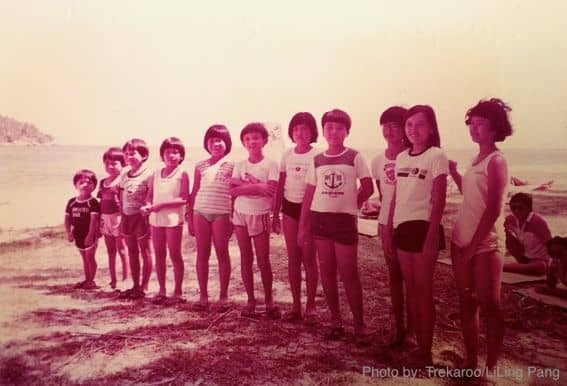 The camping trips to Pulau Dayang became the fuel for many of the stories I wrote in school. Their impact runs like a vein through my life. They set my path on a trajectory for adventure. Little did I realize that I would be drawn to my husband for his sense of adventure and love for the outdoors. After we got married, we were quick to sell our possessions to travel around the world for a year. During our travels, a myriad of crazy situations stoked our love for exploration. We were once stranded amidst safari animals at night. 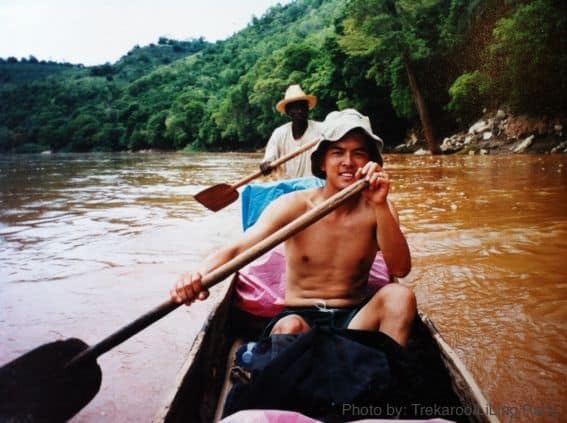 We canoed down a river in Madagascar in a dugout tree for four days and ended up with amoebic dysentery. We swam at the edge of Victoria Falls next to elephants. Our travels through developing countries allowed us to meet wonderful people and develop compassion for those in need. These early travel adventures so inspired us both that we decided to make travel a priority. This is why we travel. It’s a gift we want to give to our kids and we have made financial sacrifices in other areas in order to travel. People often ask us where we got the inspiration to start Trekaroo, and I guess, the story really could be traced back to the little island of Pulau Dayang. I am so incredibly grateful for my parents who never let inconvenience or a lack of funds stop them from taking their three little girls on family adventures. Whether it was to a deserted island or on a 12 hour plane ride to Europe, these travels are some of my warmest childhood memories. Travel is the tie that binds me to my siblings though we all live thousands of miles apart. I trust that in the midst of our family’s travels, our children will also find their passion and purpose for their lives. 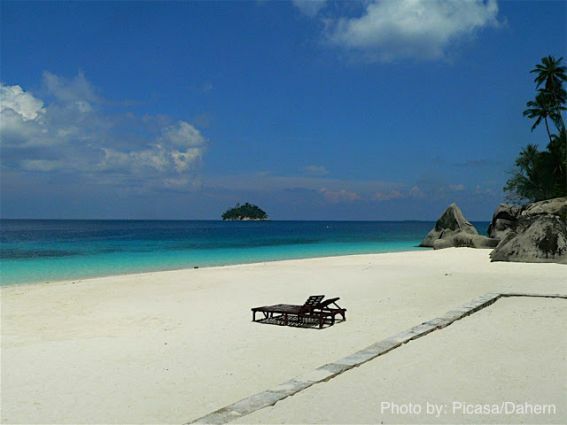 If you would like to experience a virtual vacation to Pulau Dayang as it is today, be sure to check out the amazing sights here. We’re excited to kick off this brand new series here on Trekaroo where you get an inside glimpse into why our family of writers have chosen a traveling lifestyle. 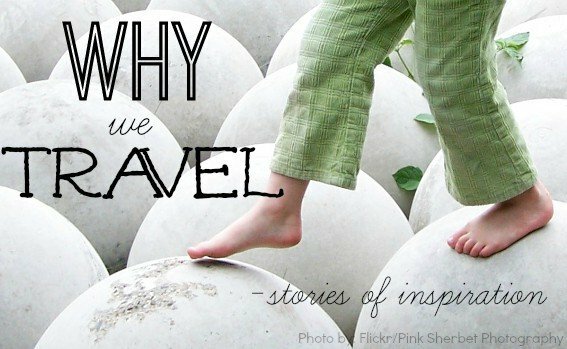 To see other articles in this inspirational series, check out Why We Travel. We would love to hear your story. Tell us why you travel in the comments. Wow. What cherished memories! Thanks for sharing! Liling, I love that your family instilled that adventurous spirit in you. While the only adventures I had as a child were in my backyard, I can totally identify with the reason you connected with Brennan. My husband had a sense of adventure and a lack or inhibition when I met him. Little did I know it would make us the parents we are today and change the way we too are raising our children. I wouldn’t have it any other way! I hope we are instilling that same spirit you were gifted from your parents. Thanks for a great story!